I'm playing catch up here, trying to remember the things we've done which were blog worthy while I was immersed in Richard III. This post is one I wrote a few weeks ago but never got around to publishing here. We've been doing a lot of work with shapes lately, looking at how to use shape stencils to make pictures, playing with magnetic shapes, talking about relative size and measuring shapes on graph paper. 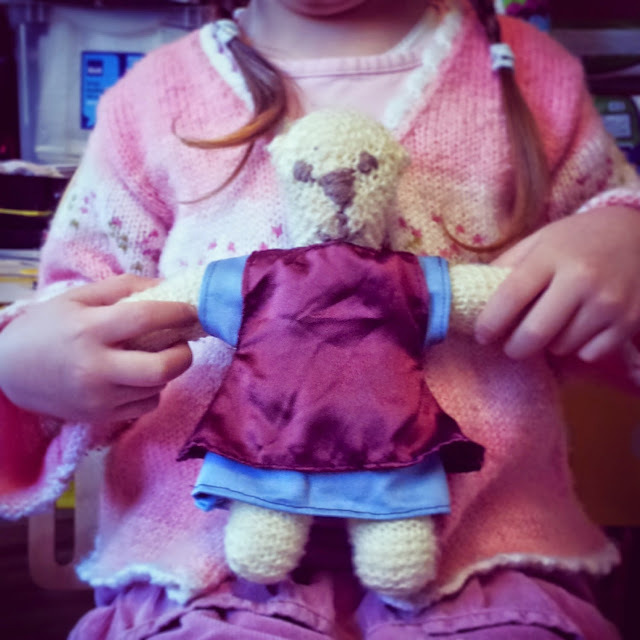 I wanted to tie all this together in M's mind with a fun activity, focused on her love of drawing tutus, so I talked to M about needing new clothes for Miss Sophie Bear. Miss Sophie is a simple knitted bear I made for M last year, complete with a selection of her own clothes. I think it is fair to say that M loves Sophie and she is well played with, not least because she is dressable which M loves to do. Asking M what kind of new clothes Sophie Bear would like, opened the floor gates to many impossible designs which wouldn't have looked out of place on a designers runway. After allowing M some time to draw fantasy clothes, I explained that while they were fun to look at, could she see Miss Sophie wearing them? Playing in them? Or dancing in them? M sadly acknowledged they were not very practical. I asked M if she would like to draw a real dress and we would see if we could make it? This was greeted with much enthusiasm, so we got to work. After explaining that while I would happily knit Sophie some more clothes, it would take a long time I asked M for suggestions on alternatives. We eventually settled on sewing as a possibility and M grew very excited when I revealed I do actually own a sewing machine. I also admitted I own more than one sewing machine, they sort of multiply... But I hadn't used one since before M was born, so my sewing skills were a little rusty. First up, I dug out my scrap bag and let M rifle through it, watching with some concern as she pulled out netting and sheer organza scraps to show to Sophie Bear. I had visions of having to sew two slippery, sheer fabrics together to make some sort of puffy dress! After a while and a lot of dancing around with a bear draped in various fabrics, M finally settled on two fabrics. A firm but medium weight blue calendared cotton and a lightweight burgundy silky fabric which would have originally been used for lining. M explained the blue cotton was firmer, more structured and should be an under-dress as it would support the thinner, more floaty burgundy fabric which would sit on top. I asked M to draw a picture of what she had in mind, which I then reinterpreted in a simple sketch so I could confirm I'd understood what she was after. 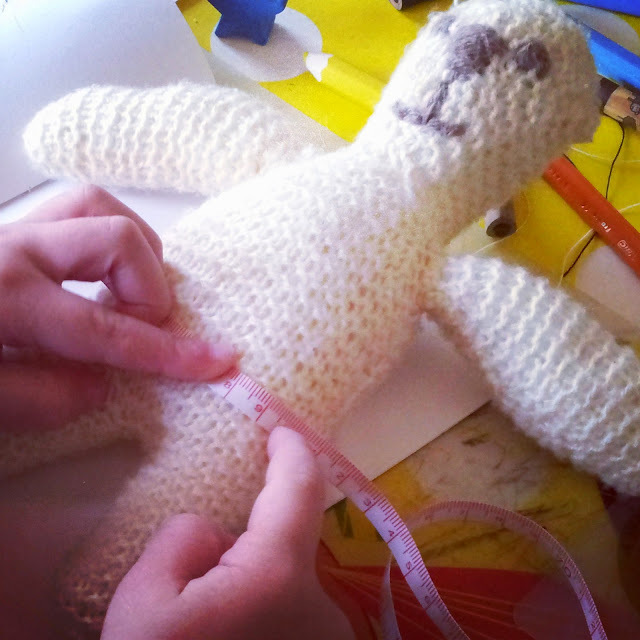 Together we measured Miss Sophie Bear, taking down her sizes and learning how to read a tape measure. M had lots of fun playing with the retractable tapes and measured Sophie several times to make sure we'd got the details right. Measuring Miss Sophie for her new clothes. 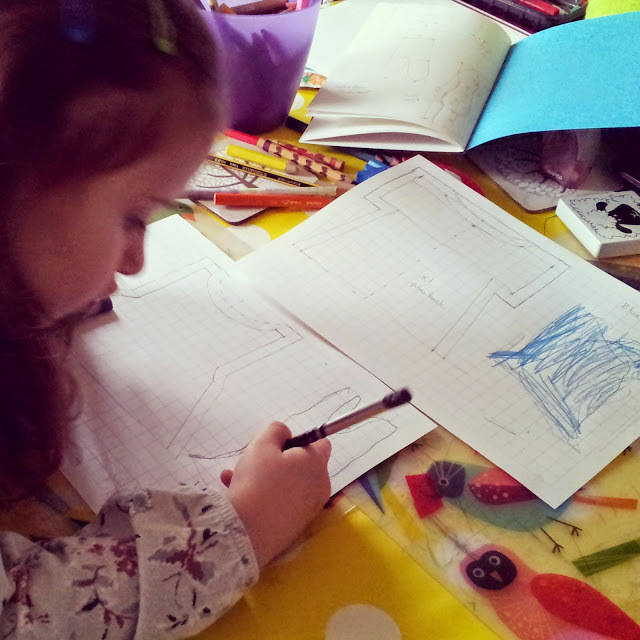 With Miss Sophie's measurements on paper, we drafted our pattern. M and I looked at some of M's clothes, studying the shape, the seams, how they were put together. We used 1 cm grid graph paper and rounded all measurements up to whole centimeters and worked together to transfer the measurements taken earlier to the pattern. I kept it simple, Sophie's arms are 'T' shaped, so I decided this dress could be 'T' shaped too with nothing complicated for the sleeves. I added a seam allowance and after watching me for a while M felt confident enough to draw in some of the lines herself. There was an odd moment when M told me she was worried and scared about making the dress; she said she was afraid it would go wrong. I gave her a hug and reassured her that I understood her concern and if we were using expensive fabric I'd be a bit anxious too. However, as we are using left over fabric there was nothing to worry about. If things went horribly wrong, it would be a bit disappointing and we'd have lost a little fabric, but we would have learned lots in the process which would mean that next time we'd do better. 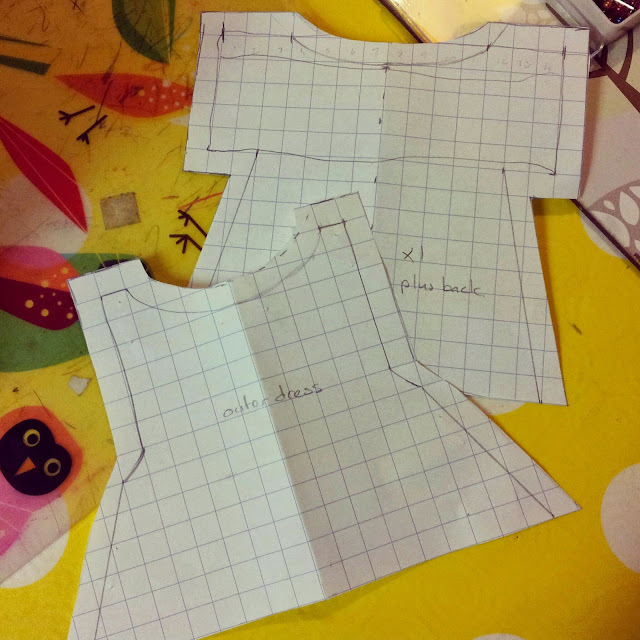 We were finally ready to cut out our pattern and then our fabric pieces. 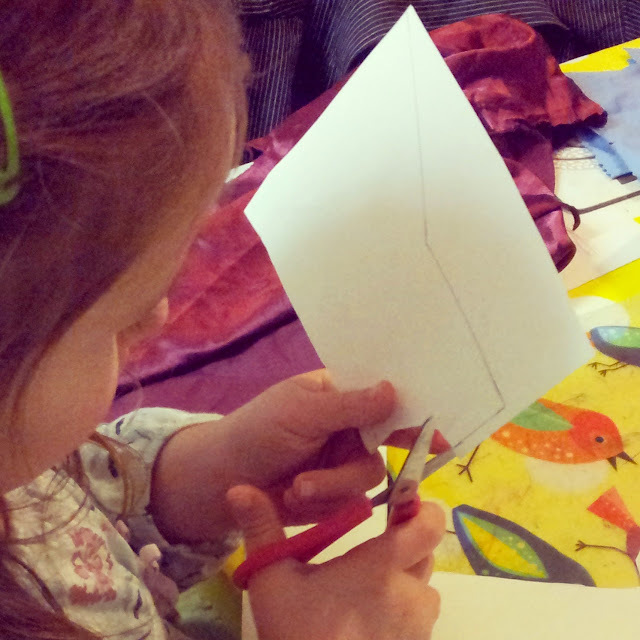 M cuts out our pattern pieces. It took us a long, long time to get to this point so I called a halt for a couple of hours so M could recuperate a little. Once she was ready, we got the sewing machine out, dusted it off, threaded it up and I began to sew. It was a bit hair raising, I have to say. M was watching closely, trying to supervise and I had to keep reminding her to keep her fingers out of the way! I've also never sewed anything this tiny on the sewing machine and the burgundy stuff was a nightmare, refusing to stay where it was put. Ideally I should have adjusted the tension, practised and perhaps tacked first so the dress pieces were easier to sew, but with M hovering I wanted to get the job done quickly. It took me at least an hour and half to sew this little dress together. I edged the burgundy stuff first to stop it from fraying. The blue fabric I pinked much to M's amusement as she decided my pinking shears had a silly name and looked like monster scissors. Normally I'd have pressed the seams, but again I skipped this for speed. A press fastening at the back allows the dress to be closed at the neck. Miss Sophie, modelling a dress as designed by M.
M was very excited and ran off with the dress as soon as the last stitch was placed. A job well done I think.